Glamping is the new buzz word – Glamorous Camping. 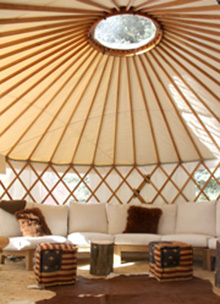 Once you have spent time in your yurt, you can’t help but want to customize and raise your camping experience. While yurts are always far more luxurious that any tent, there are many of things you can do to make your next camping trip even more comfortable. 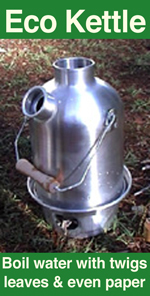 We have camped in our yurt for many years and I have tried & tested lots of ideas and inventions. Some of them you can buy and others will give you some ideas of your own. Not what you may think of as being typical yurt equipment, but a great way to cover the roof ring – a great lightweight, smaller and cheaper option to the Polycarbonate Dome ideal for summer camping trips when the odd shower comes through (just remember to tie it off at night if it’s windy:-). A good bed is worth it’s weight in gold as far as my wife is concerned. We slept on the ground for several years, but as that grew old and the kids invaded, we splashed out on a queen sized collapsible frame bed with an inflatable mattress. We find that inflatable mattresses tend to go down at night and you both end up rolling to the middle. That said, we recently stayed at a friends house on an inflatable bed from Costco. It was a very good bed, had a built in inflater (110v) that was very quick and it stayed inflated all night.